It’s a man’s world. At least, it still is in Australia’s workplaces. In 2016, Australian females pocketed significantly less than their male counterparts, on average earning about 70 per cent of males’ weekly incomes. The reasons behind this gap are as hotly contested as the debate over what policy makers can or should do about it. However, the gender divide does not apply to all sections of the labour market equally. This year’s headlines have been dominated by workplace equality issues among our top earners. Lisa Wilkinson’s recent departure from Channel Nine sparked huge debate over the gender pay gap, and earlier this year the BBC revealed two-thirds of their best-paid on-air stars are men. Previous studies have also found a large gap for high-paid professions and occupations. But what about employees at the other end of the pay spectrum - those who receive the legal minimum wage for their job? Arguably, it’s the gender pay gap among these low-wage workers we should be most concerned about. In 2016, almost a quarter of Australian jobs were paid at the minimum or ‘award’ rate, a rate that is in most cases set by the Fair Work Commission. At first glance, one might expect the gender pay gap to be zero among minimum-wage workers, since by definition they are all being paid the minimum wage. But, there are in fact many different minimum wages in Australia. There are currently 122 federal awards, covering a variety of industries and occupations, and with each specifying numerous different minimums depending on things like the tasks and duties of the job and the qualifications and experience of the employee. 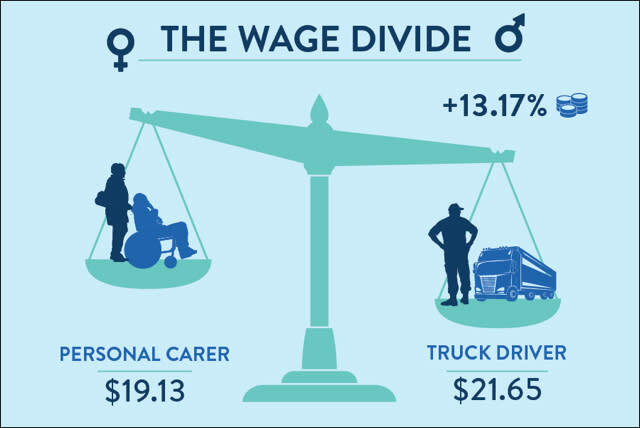 This, combined with the fact that men and women differ in the types of jobs they do, means that it is still possible for a gender pay gap to exist among minimum-wage workers. Drawing on HILDA Survey data from 2008 to 2014, our research found that award-reliant women earn approximately 10 per cent less per hour than award-reliant men. While this gap is smaller than the 19 per cent gap we find among employees who are paid above the award wage, it is still considerably greater than zero. Importantly, we also find that the gender wage gap among award-reliant employees can’t be explained by differences between men and women in their skills and abilities, as measured by their work experience and education. Unlike market wages, the gap among minimum-wage workers cannot stem from employer discrimination, superior negotiating skills of men, or higher productivity of men, since everyone is being paid the minimum permissible rate of pay. So where does the gap come from? It turns out that award wages are systematically—and perhaps unfairly—lower in jobs more commonly held by women. 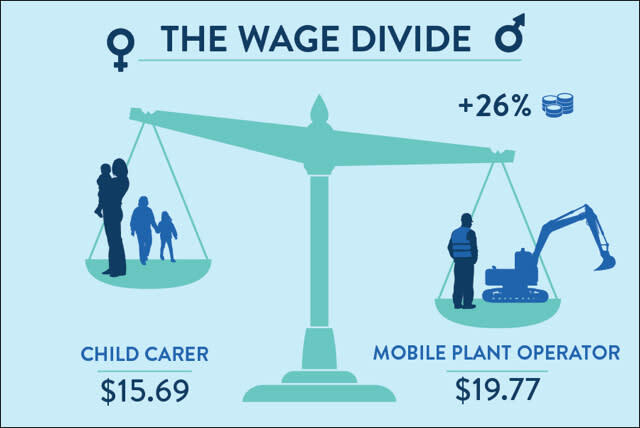 The higher the male share of employment within an occupation or industry, the higher the wages of award-reliant employees, for both men and women. For example, award-wage workers in the health care sector earn substantially less than similarly-skilled award-wage workers in road transport. 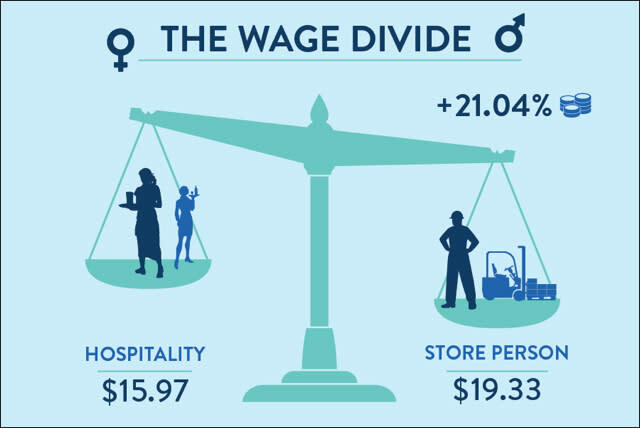 In short, minimum wages could do more to close the gender wage gap if they were neutral with respect to the gender composition of jobs. Does that mean that policy-makers—and in particular, the Fair Work Commission—should act on this? The answer to this question depends on the reasons why the Commission sets lower minimum wages for jobs more commonly held by women. There are two main explanations that have sound economic rationales underpinning them. First, in order to not jeopardise employment in an industry, the Fair Work Commission might intentionally set lower minimum wages where employers have lower “capacity to pay”, for example because employers have little market power. Secondly, minimum wages might partially reflect fair compensation for characteristics of jobs unrelated to their skill requirements, such as their dangerousness or dirtiness. However, these explanations are at best only partially convincing. Nursing, for example, is both female dominated and characterised by employer market power. Likewise, while compensation for jobs with unpleasant characteristics is a plausible explanation for higher award wages of mostly-male construction workers, we find wages are low among award-reliant hospitality workers, who are disproportionately female and often perform physically demanding work in hot and loud environments. This is not to say that capacity to pay and job characteristics have no role in the observed patterns of minimum wages across industries and occupations . But we have no way of knowing the nature and extent of their roles, since there is little transparency in the reasoning driving the differences in minimums set by the Fair Work Commission. This leaves room for the possibility that the lower minimum wages in female-dominated occupations and industries are driven—at least partly—by an unfair under-valuation of “women’s work” grounded in prejudice rather than sound economics. 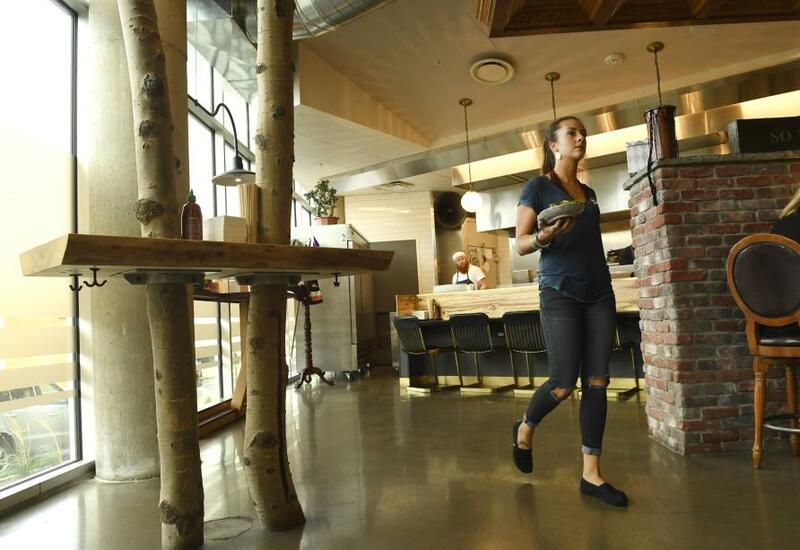 A wage-setting process that explicitly acknowledges and quantifies the factors considered in determining minimum wages could ease this concern. Until then, we cannot have confidence that the award wage system does not systematically put women relying on minimum wages at a disadvantage.